Pardon my absence. It is not the lack of cooking but the lack of time that has kept me away from my blog. I hope that you guys are doing well. Today I will present you with a very quick recipe that I love. 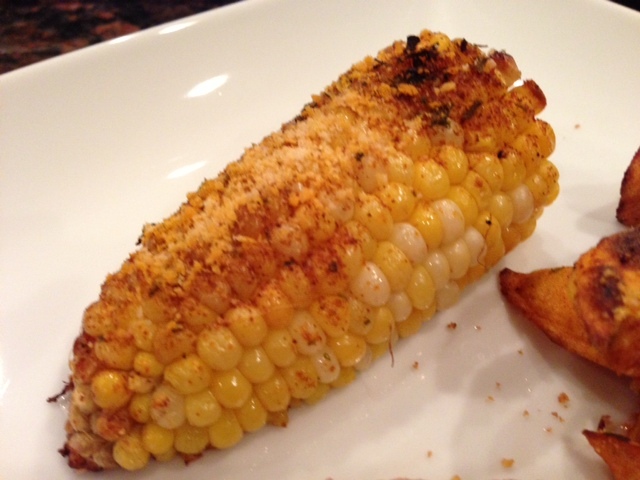 It is very easy to fix and it changes from the regular steamed corn. Corn at this time of the year is so delicious that i would eat it everyday, and now that i am using my round mold to cook it in 5 minutes, we eat much more of it that we used to. Sometimes though it is nice to eat in a different way. I saw this recipe many months ago on TV and tried it right away because it was so easy and fast. I hope that you will enjoy this as much as I am. 4 tsp of Paprika or chili pepper or even cayenne pepper. Place all 4 ears in the round mold and cover the round mold with the octogonal silpat. Microwave for 3 minutes. The corn will not be thoroughly cooked but it will cook longer in the oven. With a sharp knife, and being very careful to not hurt yourself, slice the corn ear in half. Place the corn face up on a plate and with a knife, spread the mayonnaise. Then sprinkle Parmesan and the spice that you wish. 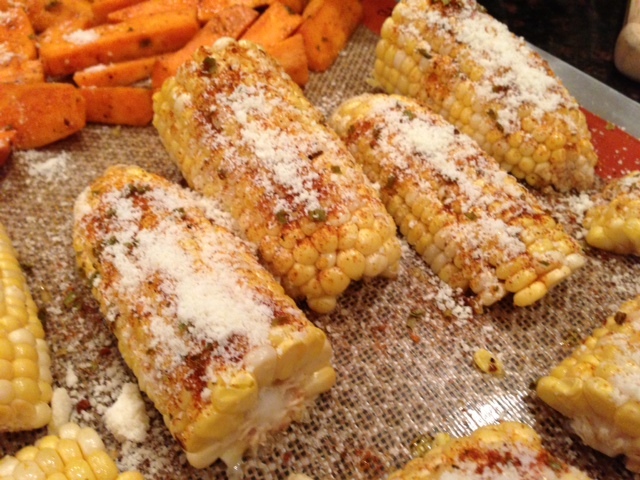 Or mix the spice of your choice with the Parmesan in a large bowl and dip the corn into the mixture making sure to cover the corn entirely with the mixture. Lay the corn face up on the silpat that would have been placed on a perforated sheet. Cook at 450 for 5/7 minutes. Accompany this wonderful corn with a meat of your choice and enjoy!! !